benefitsCONNECT® has been set up with what are considered to be the standard types of qualifying events. Please contact your Broker or Account Manager at benefitsCONNECT® if you would like to add any qualifying event types. 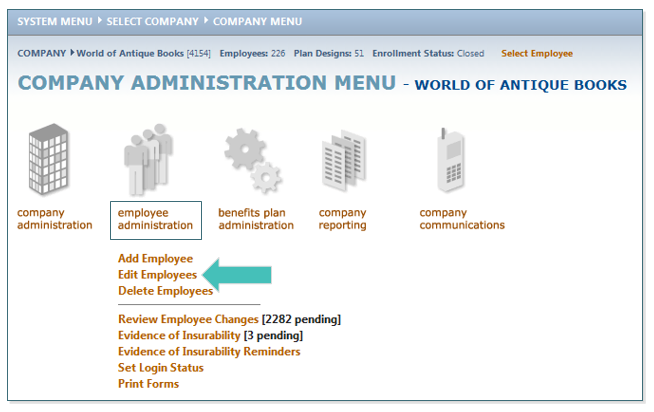 The next several pages will outline some common qualifying events and how to apply them for an employee or their dependent(s) within benefitsCONNECT®. 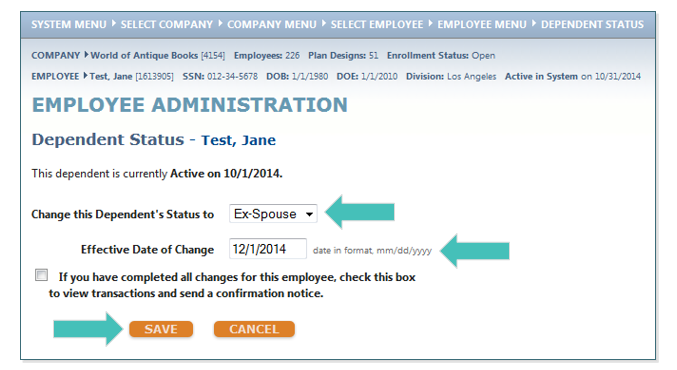 Search for the employee whose spouse’s status has changed. Click Dependent Information and then click the down turned arrow next to the spouse’s name. Select Ex-Spouse from the drop-down menu for Change this Dependent’s Status to and enter the Effective Date of Divorce in the Effective Date of Change box. Click SAVE. This will prompt a pop-up message to appear saying this status implies that the “Marital Status” should be changed as well. Click OK. 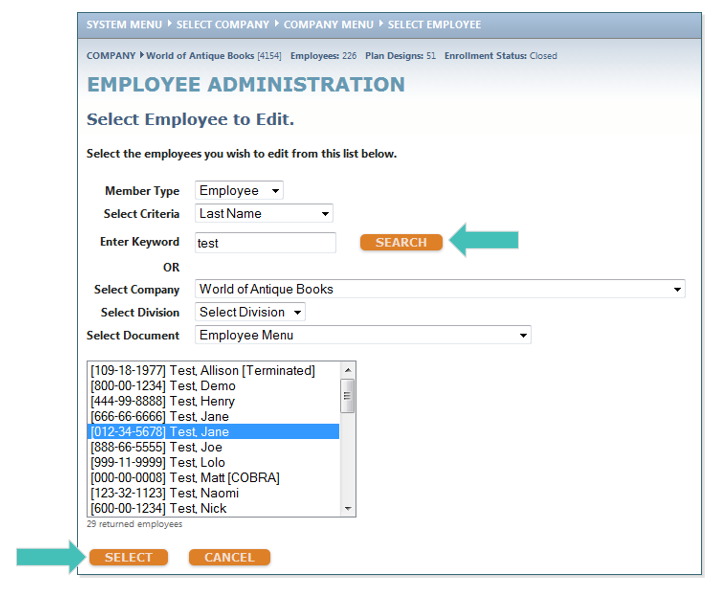 The system will now navigate you to the Employee Profile page where it automatically updates the Divorce Date provided on the previous page. Click SAVE. TIP: Based on these changes, the system will trigger a COBRA qualifying event and send notification to your COBRA Administrator, as long as the site set up to do so. This will take you back to the Employee Administration page. 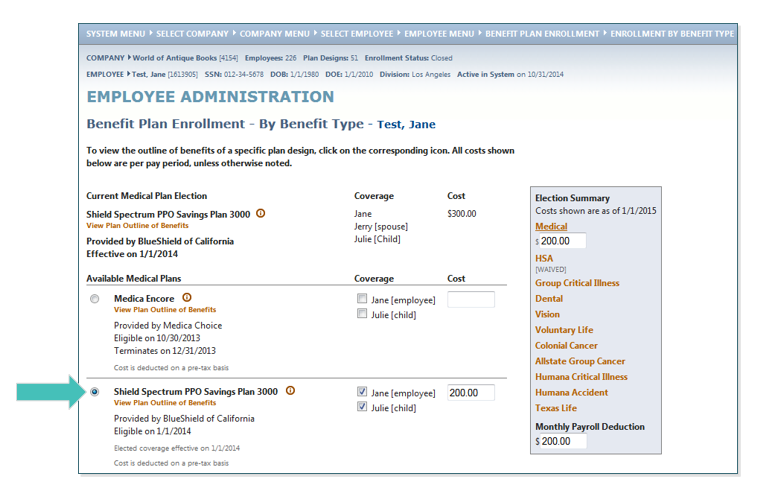 Click Benefits Plan Information and then click Benefit Plan Enrollment. Select the first plan in which the ex-spouse is enrolled. TIP: You will notice that the spouse is still indicating as enrolled. This step is to remove the spouse from coverage. 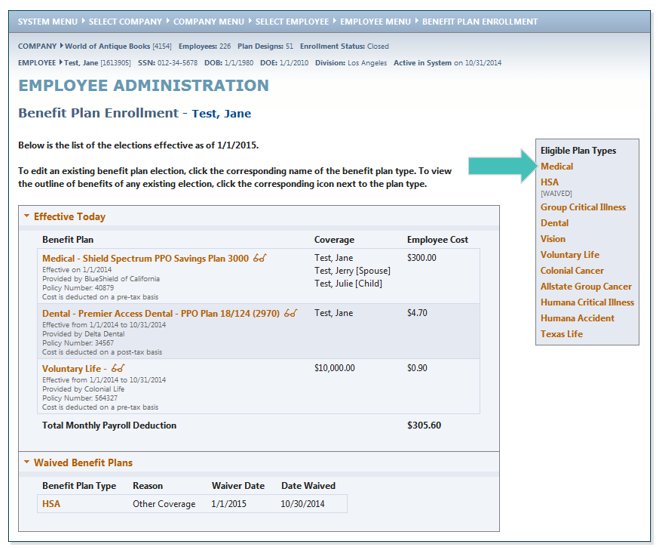 Click the Radio Button next to the plan in which the employee is enrolled. An alert will appear indicating that an enrollment change must have a Qualifying Event reason. Click OK. In the Qualifying Event drop-down menu, select Divorce. In the Qualifying Date field, enter the date the divorce is final. Click CONTINUE. At the bottom of the screen, enter the Effective Date in which the spouse is no longer covered in the field named, please enter the Effective Date for this new enrollment. TIP: This date may vary by carrier, but is usually the first day of the month following the Qualifying Event date. 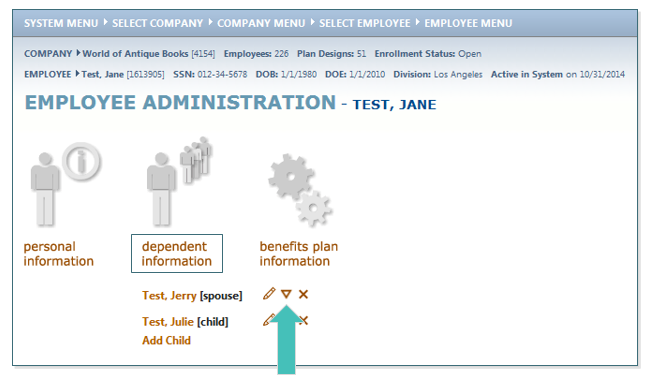 In the Please enter the Termination Date for past enrollment box, indicate the last day the spouse is a covered dependent. TIP: This date is ALWAYS the day BEFORE the date you entered for the Effective Date for the new enrollment.